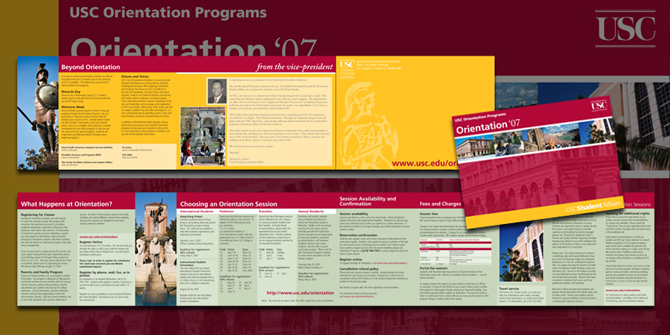 Informational brochure for the University of Southern California sent to the incoming 2007 freshmen. In past years, the University sent out packets with dozens of pages of information to incoming Trojans but found most students arrived having not read the materials. This four panel brochure uses a clean hierarchical layout to distill and communicate information in an easy to hold package. We worked directly with the Department of Orientation and the Dean of Student Affairs to make sure this highly scrutinized design was a fitting first introduction to the prestigious school. Additionally, a strict color scheme based on the University’s colors was adhered to. The new design was so successful, USC has used it as a template ever since. To date, this brochure has been sent out to approximately 12,000 incoming students.